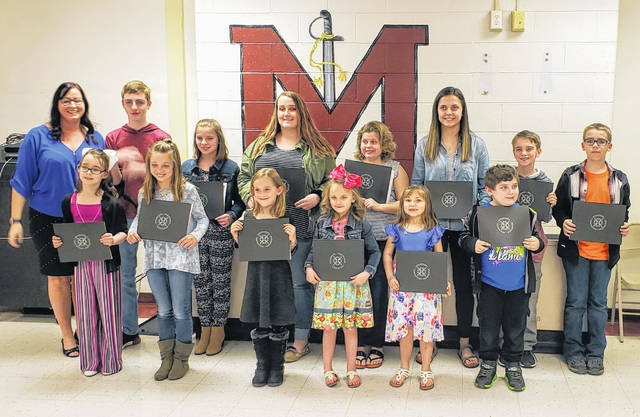 Meigs Local Students of the Month are pictured with Board Member Heather Hawley. Members of the varsity girls basketball team are pictured at the recent Meigs Local Board of Education meeting. 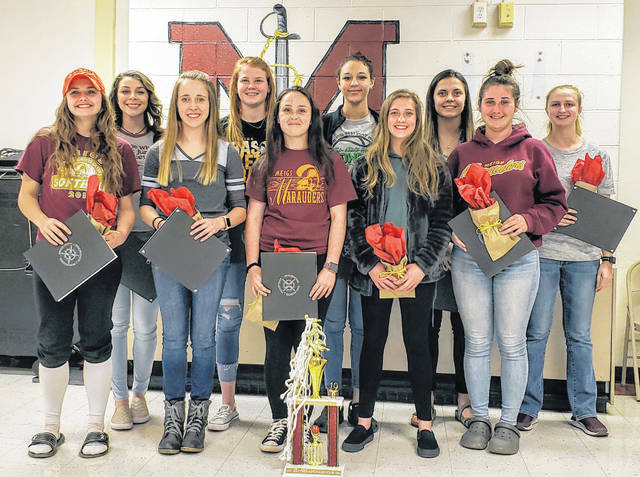 ROCKSPRINGS — The Meigs Local Board of Education recognized Students of the Month and members of the Lady Marauders Basketball team during the recent board meeting. Students of the Month honored were Marissa Noble, Tiffany Tripp, Katie Brinker, Charles Matthias Stansbury, Cameron Davis, Gage Hoffman, Aaliyah Ogdin, Dillon Howard, Sarah Stark, Jonathon Wyatt Kauff, Maddison Shelton, Jorden Johnson, Katelyn Ritterbeck, Savana Stanley, Chase Dodson, Taylor Johnson, Branton Roush, Juliet Arnott, Bailey White, Emma McKnight, Makynleigh Johnson, William Powell and Braylee Adkins. The girls varsity basketball team was honored for their recent sectional championship win during the 2018-19 basketball season. Varsity team members were Alyssa Smith, Taylor Swartz, Marissa Noble, Madison Fields, Olivia Haggy, Mallory Hawley, Kassidy Betzing, Becca Pullins, Kylee Blanks, Jerrica Smith and Breanna Lilly. In personnel matters, the board accepted the resignation of Jamie Deem, Meigs Middle School math teacher, effective May 31 for retirement purposes. The resignation of Connie Quivey, middle school cook, was accepted for retirement purposes, effective Aug. 1. Approved a two year agreement with the Auditor of State LGS for GAAP/Financial Statements. The annual fee is not to exceed $12,750. Approved the purchase of a Gravely Zero Turn Mower from Ohio River Power Equipment in the amount of $10,084. Approved revised policies as recommended by NEOLA. Approved the cafeteria report as submitted by Christina Musser, food service supervisor. Approved the minutes of the previous meeting.